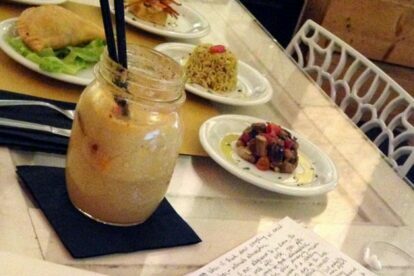 I’m sitting in Baylon Café as I write this entry, thankful to have found an accommodating café with free wifi in Trastevere. Trastevere is full of cute places to eat and drink but Baylon is special – it has plentiful outdoor seating on one of Trastevere’s cutest streets, a delicious and inexpensive aperitivo, classic rock playing on the radio and vintage books for sale lining the walls. It also has longer tables in the back and free wifi so you can bring your computer here if you need to work. The crowd is young and hip and the décor is cool, creating a nice atmosphere throughout the day. Open from morning and through the night, Baylon Café is a great place for lunch and aperitivo. The menu is creative and comforting, featuring Italian classics with some international fare. Stop by for brunch on the weekends for vegan French toast, omelettes and Moroccan eggs. Baylon has outdoor seating you can enjoy in the warm weather and makes excellent cocktails to sip accompanied by small plates. The menu is fairly reduced at dinner (only offering a handful of traditional Roman dishes) so it’s better to stop by during the day when you can find something to please any palate!